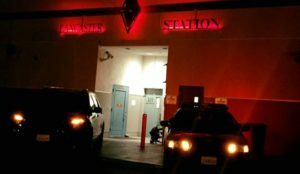 LANCASTER – A man on probation with three outstanding warrants was captured by Lancaster Station deputies Sunday evening after a foot pursuit, authorities said. It happened around 6 p.m. Sunday, Jan. 27, when patrol deputies stopped two men for riding their bicycles at night without headlights, according to a news release from the Lancaster Sheriff’s Stations. “While both men were originally cooperative, one man, later identified as 21-year-old Malachi Wiley, became uncooperative when deputies found what appeared to be methamphetamine in his pocket. The suspect ripped his hands away from the deputy detaining him and began to run away,” the news release states. “The deputy pursued the suspect on foot, changing directions several times across West Avenue I. When the suspect realized the deputy was still behind him, he abruptly changed directions once again, colliding into the back of a moving vehicle,” the news release states. Wiley was detained and then arrested on suspicion possession of methamphetamine. Wiley, who is on probation for burglary, has a no bail warrant for resisting arrest, a $100,000 warrant for carrying a concealed firearm and a 100,000 for child endangerment, according to the news release. 3 comments for "Probationer with 3 warrants arrested after foot chase"
Lancaster Citizen of the Month!